Perched in the Transylvanian mountains like a harbinger of death or a vulture or something equally as creepy, the castle that inspired Bram Stoker’s “Dracula” tale is now for sale. Although only allegedly believed to be the inspiration for the Irish author’s description of Dracula’s castle in the book, tourists still habitually flock to the castle year after year for a taste of horror-themed nostalgia. Vampire lore aside, this castle has many tales to tell, seeing as it’s located in Europe (where history comes from! ), more specifically, in Bran, Romania. It was built in 1212 by Teutonic Knights who created the wooden castle as a fortified location at the entrance of a mountain valley used by traders for more than a millennium. It was also used as a defense against the Ottoman Empire in the 1400s, and over the next few centuries, it served as a customs point. The castle has exchanged hands plenty of times since then, and even played a strategic military role in the mid-18th century. Calling the castle "ominous" is probably the understatement of this lifetime. Even though it might have been the inspiration for a fictional tale about a blood-thirsty vampire that doesn’t exist, I probably still wouldn’t want to spend a night there. But as a horror aficionado myself, you can bet that if I ever find myself randomly roaming the streets of Romania, I’d be all over this like white on rice (or maybe “blood on vampire teeth” is a better analogy here). 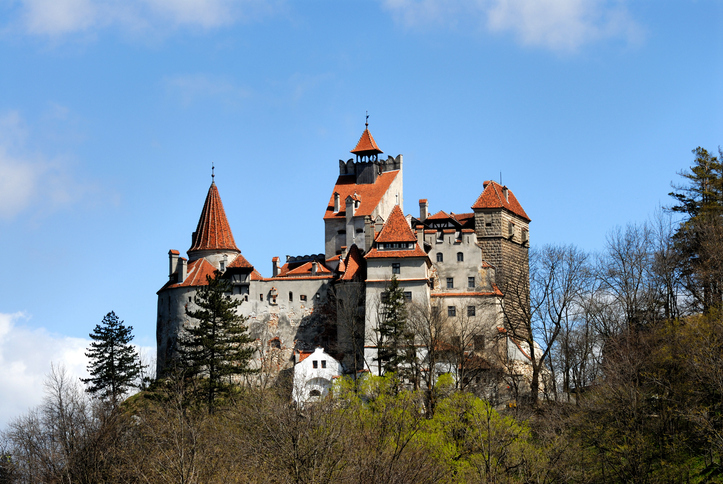 Bran Castle was reportedly offered to the Romanian government for a hefty price tag equivalent to $80 million USD. The public listing price has not yet been announced, but the owners are looking for a buyer who will continue their vision of maintaining and growing "the largest and most significant attraction in Romania." It is uncertain if the purchase will come with its very own Renfield. Nick Caruso is RISMedia’s Senior Editor. His favorite horror movies are Halloween, Scream and Sleepaway Camp, but not necessarily in that order.